So, here is the very first early sketch of a new painting. This is the 4th of my “Face of Love” series. 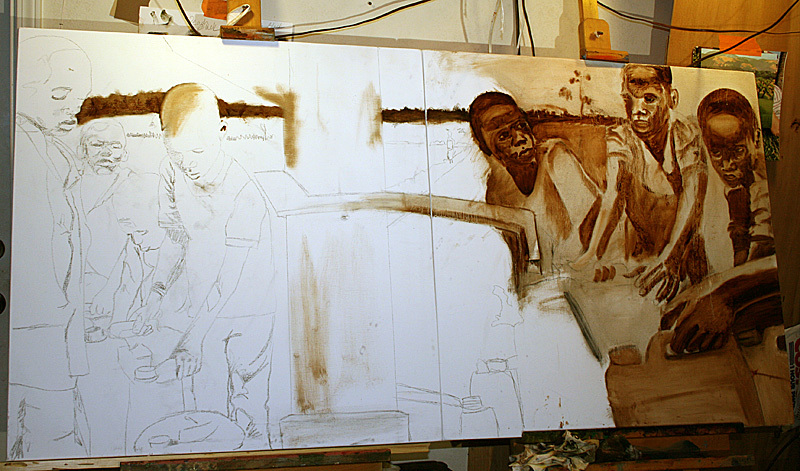 After drawing it with pencil, I began to do a wash of burnt umber and walnut oil. I will not be able to get back to it until Sunday night. This will be called “I was Thirsty” and is going to be my hope that through it, I will raise the funds necessary to build a well in a waterless village in Africa. I am inspired by the hundreds of churches that are conspiring together this Advent Season to provide funds to allow Living Water to build hundreds of new wells around the world. I know a few more churches this year that are involved in this effort. I am joining in with this new painting. I will be spreading the word throu this blog, and in due time, through art shows. Now to get back to painting … which will be difficult during this time of year. but I will work on it as much as I can. Soon, I will also be adding a new “Faces of Love” page to display each of the paintings in the series together.